The Band of the Hawk may have been the most formidable band of fighters around, but when matched up against an army of abyssal monstrosities, earthly fighting skills don't amount to a hill of beans. The Hawks' tortured and mutilated former leader, Griffith, has used the accursed Crimson Behelit to open the gates to a shadowy realm of unspeakable horrors, the realm of the demon lords of the Godhand, who are willing to transform Griffith into a being of terrible power and majesty as long as Griffith is willing to give up his former command as sacrifices in the Invocation of Doom. 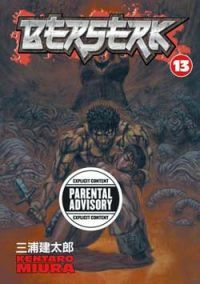 But nobody takes down the Hawks without a fight, and their berserker champion, Guts, will take on anything Hell can throw at him in order to save his lover, Casca, from the sordid violations that only Hell can offer.